I am becoming more and more interested in obtaining my own seeds directly from the plants I've grown. My Father-In-Law has shown me how with marigolds, and when I saw these dried peas still on my aging plants (see pic), I wondered if you could with peas as well. Apparently you can, as I read on this and many other web sites. 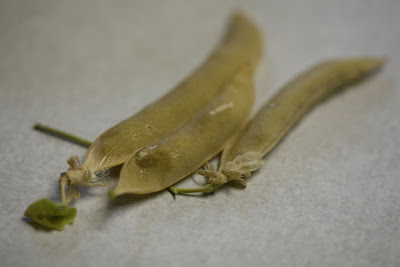 The trick is to leave the pods on the plant until they're very dry, and then store them in an envelope until next season. You want all of the moisture to be gone, so that no mildew forms during storage.